sAfter many attempts, I think i am satisfied with the result of this recipe , it is sweet enongh and the saltiness is just right. 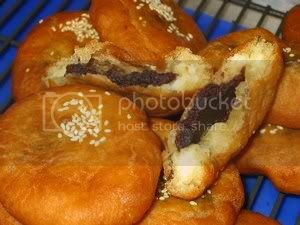 The recipe is for plain with 5 spice powder but a filling of red bean paste is also good eats. Mix 100 g flour with 100 ml water and 1/2 tsp yeast and mix into a dough. Leave to ferment for two(2) hours. Mix all the ingredients in A. and knead into a smooth dough. Roll out the dough 25mm thick. Rub five spice powder and sprinkle some water on top of rolled out dough. Roll the dought to resemble a swiss roll. Cut it into 12.5 mm thick pieces. 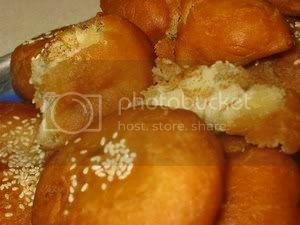 Roll each into a flat round, brush with a little water and sprinkle with sesame seeds. Heat cooking oil for deep frying. As soon as the dough floats to the top, it has to be turned and flipped until it bloats. Eating this brings me back to my childhood where if you want to have the best Loh Mai Kai in Seremban, my dad will remind us the night before, to wake up before 6.00 am so that we can be in the Dim Sum Restaurant Toong Chan as early as possible otherwise all the Loh Mai Kai will be sold out. Now, i have this anytime i wish, they are frozen and can be heated in the microwave in a jiffy. 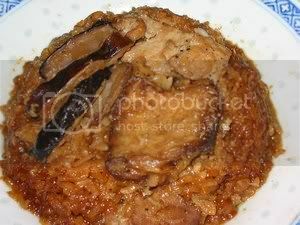 Wash glutinous rice, then soak it for two to three hours. Steam it for 30 minutes. Cut chicken into slices. Marinate with seasoning (A) for about one to two hours. Heat oil in big glass bowl and microwave for 2 minutes. Add the chicken and mushrooms, microwave on high for 2 minutes , stir and cook for another 1 minute more. Grease six small-size rice bowls. Arrange mushroom slices, a few slices of Chinese sausages ,chicken and bbq pork slices. Top up with glutinous rice and press down with a ladle. Fill the bowls with water/chicken stock, make sure the water level is above the rice. Steam for 30-40 minutes. Alternatively, wrap the bowls with plastic wrap , poke the wrap and microwave on high , 3 bowls at a time for 20 25 minutes. 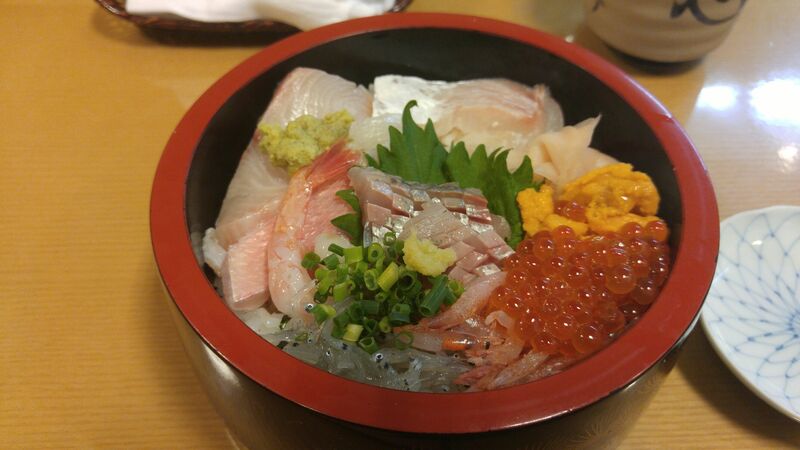 Repeat with the other 3 bowls. Turn over the rice bowl onto a plate and serve or leave to cool before wrapping tightly with wrap and then foil, leave in the freezer. When you need to eat them, remove the foil and microwave until heated through. Loh Mai Kai can be eaten with chilli sauce. Thank you Vin , my bibik from Florida for reminding me that i have not made this since my mother-in-law passed away in 1991. Sambal Lengkong calls for Ikan Parang(Wolf Herring) but any meaty fish will do , in fact fillet would save you alot of time and for the spices I have gone very short cut. Lately i have to cook like the Iron Chefs, have food on the table as fast as i can as Alexander is 15 months and he is as curious as Curious George, chasing him around takes up all the time. Steam the fish fillets until cooked. Flake them when they are warm and they should be flaked very finely. (use a pestle and mortar if available). 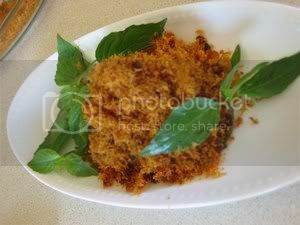 Mix the red curry paste, belacan, salt and sugar with the coconut milk in a large microwable bowl until well combined. Add in the liquid from steaming of fish fillets. Add in the flaked fish and microwave on high for 2 minutes. Stir thoroughly. Cook further, 1 or 2 minutes(depending on how wet it is) and stir, The result should be very crispy and dried. It was already 6.00 pm by the time we got home from The Recreation Center where Renee has her swimming lesson and i have to get dinner fast as we are all famished after the swim and hot tub. Luckily, http://mytasteofasia.com has asked me to test out sme of their products and this is the most appropriate time to cook one of them, as the curry will be ready when my rice is cooked and i have dinner on the table. 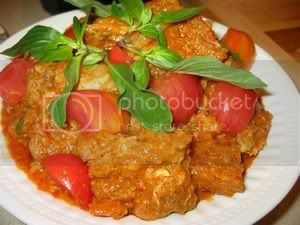 The curry is flavorful and lemon grass is greatly present and this is what makes the curry NYONYA. Season the chicken pieces with salt and pepper and when oil is hot, sear all sides of chicken until brown. Remove and leave aside. Add sliced onions into the oil and stir until the onions are wilted. 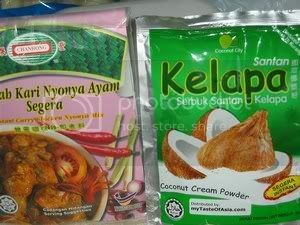 Add in the pkt of instant curry chicken nyonya mix and saute until combine, then add in the 1/2 cooked chicken pieces. Stir well. Add in 1/2 of the tomatoe wedges and then cover for 2 minutes for chicken to cook through. Add in the coconut powder mixture, stir and cook until chicken is totally cooked and the sauce has thickened. Add salt to taste and the rest of the tomatoes. For the 6 years that i have been here, Halloween night had been very cold and last night was no different, it was freezing. I had to cook fast and without fuss so that we can eat before the door bell rings like crazy. It took me less than 30 minutes to prepare this delicious laksa and i am giving this product a thumb up not because this is sponsored by http://mytasteofasia.com. but because it did taste like our malaysian curry laksa minus the cockle though. I think the dried prawns in the ingredients did the trick. 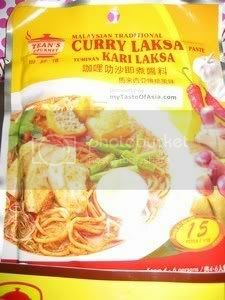 Every busy mom, students etc who missed curry laksa should have this product in their pantry. Boil a small pot of hot water and when it comes to the boil, pour it over the rice vermicelli and leave to soak until it is cooked. Drain. If using other than this brand, the rice vermicelli should be soaked first and then boil for a few minutes until cooked. Put bean sprouts in a bowl and microwave for 30 seconds on high. In a big pot, put 1500 ml water, the curry paste , chicken granules and the fried bean curds. Bring to the boil and cook on medium heat until the bean curds are soft. Add in the fish/meat balls and when the balls are heated through, add in the coconut milk. Stir and do not allow the soup to boil. Turn off heat. 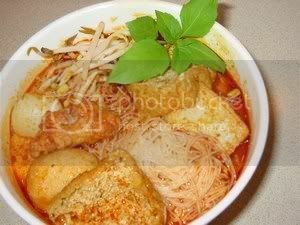 To serve, put a handful of cooked rice vermicelli and bean sprouts into a large bowl and scoop hot soup together with fish/meat balls and bean curds. Sambal belacan can be served at the side.